Last year, the Scottish Exhibition and Conference Centre rebranded itself as the Scottish Event Campus (SEC). The move underlined a growing trend towards business destinations that acknowledge a series of smaller, specialist destinations that make up a larger, global city. We’ve seen the birth of Media City in Manchester, Tech City in London, and the already popular ‘downtown’ areas across North America. Now, the brand for Scotland’s national events business has announced the arrival of an events campus in Glasgow; a specific area built purely for the purpose of hosting global events and showcasing them to the world. The SEC’s rebranding comes after a series of stellar events were hosted within the country. These events included the Ideal Home Show, Ignition, MCM ComicCon, the MTV Europe Music Awards and the MOBO Awards, along with a series of specialist conferences and congresses, culminating in the Glasgow Commonwealth Games in 2014. These events tapped into a wider community saturated with medical, academic, engineering and renewables excellence, underlining the richness in culture, medical thought expertise and opinion leadership found within the country. The concept of an event campus is to allow visitors to extend their stay, regardless of the original reason for visiting: business visitors can stay on for a concert, while concert visitors can make a day of it by indulging in a number of experiences taking place across the campus. For an event organiser, this setup is also highly desirable: a choice of iconic buildings with different layouts means exhibitions can be bolted onto conferences, or live experiences onto brand activations. It’s a world that embraces large-scale experiences as well as smaller ones. The SEC has also made itself desirable to a different kind of event: those classified as experiential, event or experience marketing. As brands become stronger, more competitive and more prevalent, it has becoming increasingly vital for companies to find ways to ignite their brands, and to do so through the medium of a live experience. This can mean a product launch, a major company announcement, a life-changing medical breakthrough, or an environment-changing initiative. The potential to boost companies’ messages stretches much further than Scotland itself: the country sits in the centre of international time zones, and so can spread a resounding message as quickly westwards, towards North America, as it can eastwards, towards Asia and the Far East. The SEC’s global connections, including direct flights to the US, Canada, Middle East and Europe from nearby Glasgow Airport, mean a brand’s message can reverberate around the world in a matter of hours. 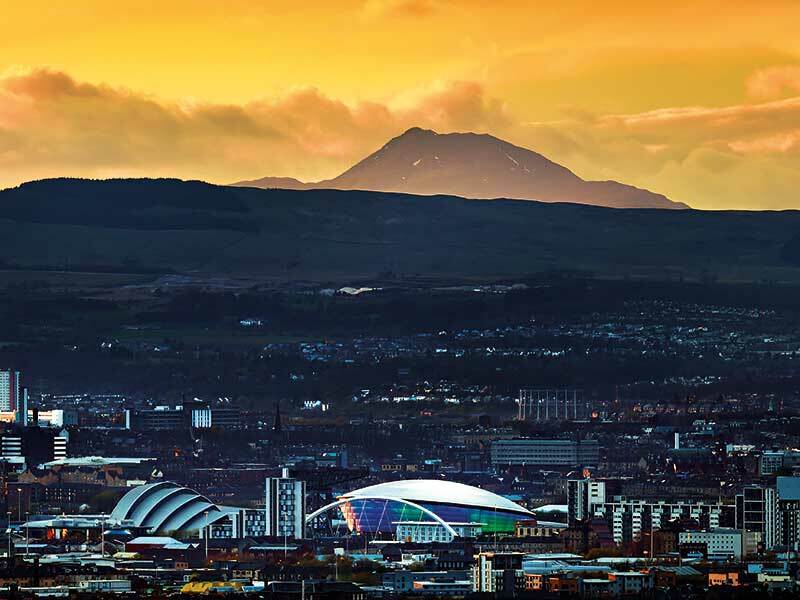 Glasgow is a glowing cultural hotspot, renowned for its music, food and vivacious population. It is also a hub for the medical, finance and education industries, and is becoming increasingly prevalent in the European energy market, with All Energy, the UK’s biggest renewable energy conference, having taken place in the city since 2014. Aside from the physical location of the venue, the SEC campus is more than equipped to host the most obscure and alternative events – from global medical conferences in the SEC conference centre to the presentation of Richard Browning’s Iron Man suit, to bringing the UK staff base of KFC together for an all-encompassing Scottish cultural experience. State-of-the-art graphics in the SSE Hydro allow logos and brand colours to be shown to a 12,000-strong audience, while the facade of the building itself can be lit in quite literally millions of different colours and shades. On a walk along the Clydeside, it isn’t uncommon to see a brand logo projected proudly onto the side of the Foster + Partners-designed SEC Armadillo building – one of Glasgow’s most iconic pieces of architecture. Brands, businesses and opinion leaders are increasingly choosing the SEC as the global stage to say things of major significance. This area of Glasgow has been specifically created to allow them to do so – to give them the drama and iconography that adds even more significance to what they say, and for their message to be given the very best chance of achieving global resonance.